The Dallas Cowboys offense looks very different in 2018 than it did at the beginning of the 2017 season. Gone are mainstays Dez Bryant (released) and Jason Witten (retired), and there's been some minor turnover on the offensive line with Jonathan Cooper replaced by 2018 second round pick Connor Williams. 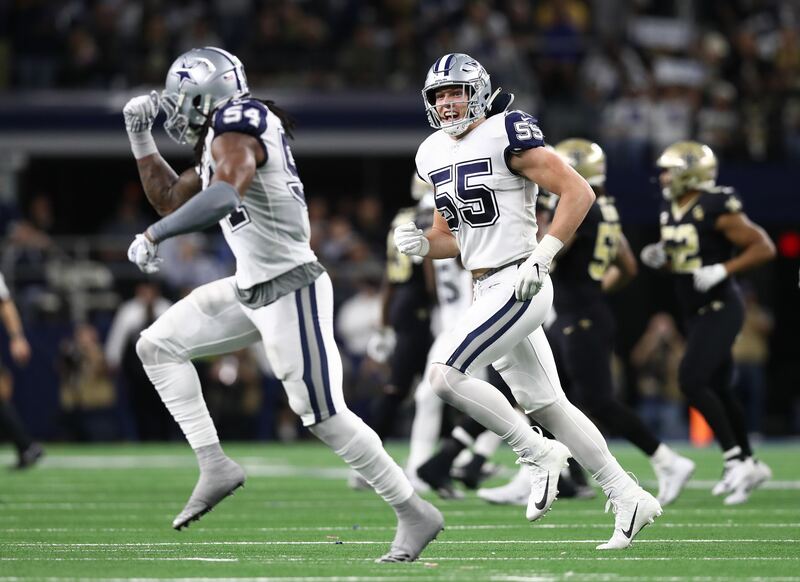 Another Williams, Terrance, may soon be given his walking papers if the league deems a suspension is in order -- if only because the Dallas Cowboys can get some cap relief through a release in that case. While there have been a few changes, the most important pieces remain. The dominant offensive line, Quarterback Dak Prescott, and Running Back Ezekiel Elliott. Today, let's look at what a season could look like for Ezekiel Elliott in 2018. Before you can look forward, it's important to look back. Though prior production does not predict future success, in the case of Ezekiel Elliott, because of his age and durability, we can use his past production to extrapolate what he could do looking forward. In 2016, Ezekiel Elliott led the league in rushing with 1,631 yards and recorded 1,994 yards from scrimmage as a rookie. 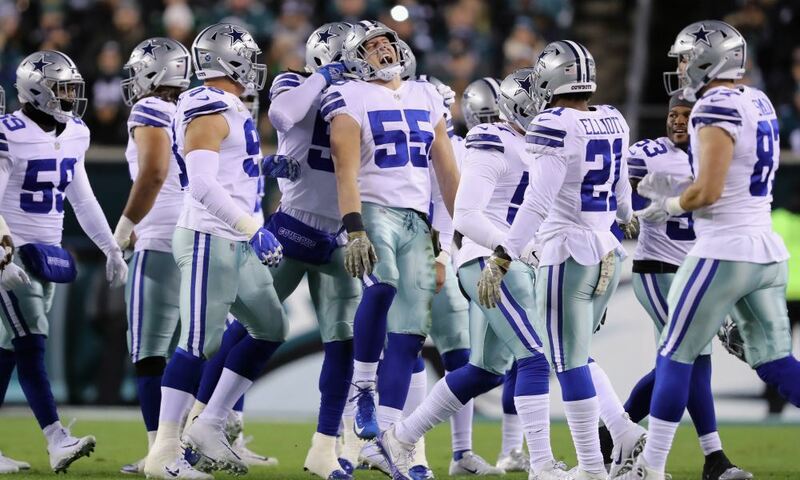 That while playing only 15 games -- the team sat most of its starters in the week 17 finale because they had already locked up home field advantage. At Elliott's 108.7 rushing yards per game, had he played in the week 17 contest against the Eagles, it's possible that his rushing total looks even more impressive as it would hit 1,738 rushing yards. He would have been well over 2,100 total yards on the season. In the earlier game against the Philadelphia Eagles, Elliott rushed for 96 yards and had four receptions for 52 yards. His totals are already impressive before you factor the 16th game into his 2016 stats. In 2017, Elliott, after being railroaded by NFL Commissioner Roger Goodell, had to sit out six games. In the ten games he played he rushed for 983 yards, seven touchdowns and caught 26 passes for 269 yards and two touchdowns. This includes the nightmare at Mile High in which Elliott only rushed for eight yards on nine carries. It was a pitiful performance from the team all around. If we extrapolate Elliott's numbers from the ten games he played for a 16-game season, we're looking at 1,579 rushing yards, 11.2 touchdowns, 430 receiving yards on 41 receptions, and three touchdown receptions. The touchdown numbers aren't as impressive as his 2016 season, but the total yardage is almost right on par with his 2016 numbers; the Broncos game included. 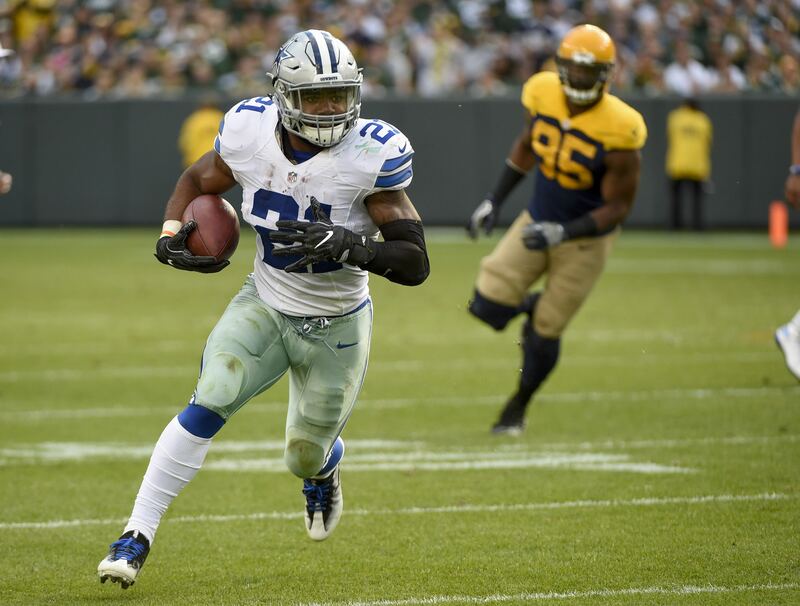 In 2016, Elliott had a better yards per carry number (5.1) than he did in 2017 (4.1), but he saw an increase in targets per game from 2.43 in 2016 to 3.8 in 2017. The Dallas Cowboys figured they needed to use him more in the passing game as his receptions per game also increased from 2.1 to 2.6. It's clear that Ezekiel Elliott is one of the best three running backs in the NFL. Of that there is no doubt. He's right up there with Le'Veon Bell, Todd Gurley, and David Johnson. Each are great in their own right and each are a ton of fun to watch on Sundays. So, based on his first two seasons in the league, what can we expect in 2018? First we should look at how the changes on the offensive side of the ball could impact Elliott and the running game. Despite how we might feel about their performances in 2017, Jason Witten and Dez Bryant are losses. Even though they didn't perform as well as their reputations might suggest, they were threats that defenses had to account for in the passing game, which made things easier for the running game. Both were on the radar of defensive coordinators and both were effective blockers in the running game. The Cowboys will be relying on tight ends who have very little experience in the NFL. Aside from Cole Beasley, Terrance Williams and Allen Hurns, the wide receiver group is lacking experience as well. Williams, at the moment, is no guarantee to be on the week one 53-man roster. It's possible that the team could be better in the passing game because they have more receivers who are good at creating separation and getting open, but we'll have to see. Opposing defensive coordinators are going to line up to stop the run and make the passing game beat them. But that has always been the case. For 24 games, Dak Prescott rose to the challenge and beat defenses. Only the final eight games of 2017, when without Elliott and tackle Tyron Smith did the Dallas Cowboys struggle on offense. The biggest addition to the Dallas Cowboys offense has to be second round pick Connor Williams. Jonathan Cooper was a good player for the team last year, but Williams is definitely an upgrade. Williams moves over from tackle at the University of Texas to guard for the Dallas Cowboys. He has the power and physicality to play on the interior as well as good athleticism and agility to work to the outside and second level. Williams next to Tyron Smith and Travis Frederick will be tremendous in the run game, and Dallas' starting five on the offensive line is arguably the best it's been since the early 90's. Fullback Jamize Olawale, formerly of the Oakland Raiders, is a nice addition to the team. He's a versatile player who can catch the ball out of the backfield or take some carries on running plays. He's an experienced lead blocker who should help open holes for Elliott when the team is in jumbo or goal line formations. Tavon Austin, who the team acquired during the draft for a sixth round pick, adds a speed and big play element that will keep teams on their toes when Austin is on the field. How exactly they plan to deploy Austin or what his snap count will be remains to be seen. There is no questioning that when he's on the field he takes pressure off of Ezekiel Elliott in the backfield. The team drafted Dalton Schultz in the fifth round in 2018 and, while he's not Jason Witten, he's an experienced blocker in a pro-style offense that saw Stanford rush for 200 yards a game. Bryce Love, Stanford's lead runner ran for more than 2,100 yards and was a finalist for the Heisman in 2017. Schultz is Bryan Broaddus' favorite to be the starting tight end when training camp breaks in late August. Allen Hurns was the biggest free agent addition to the team. Though he's had injury issues, he's been a fine wide receiver in the NFL. In 2016, he put together his best season as he totaled more than 1,000 yards and had eight touchdown receptions. He'll likely start along with Cole Beasley in 11-personnel formations and has a similar ability to get open that Beasley does. That being said, he isn't Dez Bryant. We won't know exactly what kind of effect the roster churn will have on the overall productivity of the running game until we start playing games, but at the moment, I believe the losses and gains will balance themselves out. 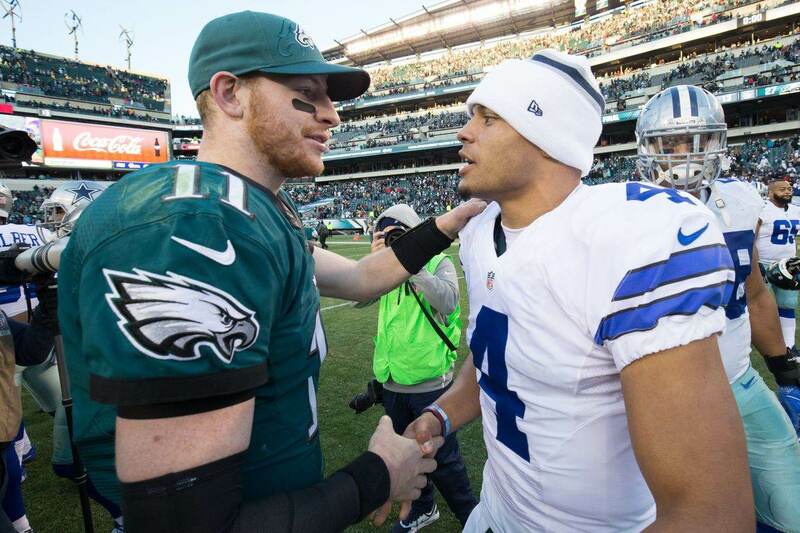 Add in the year-three progression of Dak Prescott and I think the offense gives us reason to be optimistic for 2018. For Ezekiel Elliott, we can look at his two-year totals and get a pretty good idea of what he'll do in year three. Over two years, Elliott is averaging 22.6 carries a game, which would put him at about 361 carries over a 16 game season. That would be 49 more than his 2016 total and 25 fewer than his 2017 pace. Seems reasonable to expect Elliott will see that many carries a game. Let's say he gets the 361 carries that he's averaged (with his 2017 pace included) over two seasons in the NFL at his career yards per carry average (4.6), that would put him at 1,660 rushing yards this season. If he received his 2017 pace for carries at 4.6 yards per carry then we'd be looking at 1,781 rushing yards. At his 2016 carry total it would be 1,481 rushing yards. To me that's about what you should expect from the best running game in the NFL. Anything less than 4.6 yards per carry and 1,400 rushing yards would be a disappointment. But let's look at what his floor and ceiling could be. Again, looking back, his 2017 was his worst of the two seasons in regards to yards per carry and 16-game rushing yard pace. If we take his 4.1 yards per carry (which to me makes a good floor for his production) and extrapolate that over his career average of carries per game at 22.6 and a 16 game season, Elliott would rush for 1,480 yards on the season. If he received only 322 carries like he did in 2016, that would equate to 1,320 yards rushing at 4.1 yards per carry. So, a floor for Ezekiel Elliott looks to be anywhere from 1,320 yards to 1,480 yards rushing this season. While not his 2016 season, that's a good season for an NFL rusher in today's game. Good but not great. While Dallas could win with that, it would be a disappointing rushing total over a 16 game season. Now let's look at an optimistic view of what Ezekiel Elliott could do. If we take his high for yards per carry of 5.1 in 2016, we're looking at anywhere from 1,631 (at 21.5 carries/game) to 1,937.7 (24.2 carries/game). If he got his average of 22.6 carries per game, we'd be looking at 1,844 rushing yards over a 16 game season. Any of those numbers would be great seasons for Elliott, and it seems reasonable that he could flirt with a 2,000 yard season if he gets the ball at his 2017 pace. Now, looking at Ezekiel Elliott as a receiver out of the backfield, it was clear they wanted to get Elliott more involved in the passing game in 2017. In the first four games of the season, Elliott received 19 targets and caught 16 passes. As I mentioned before, his targets per game, receptions per game, and receiving yards per game all increased from 2016 to 2017. He's averaged nearly 11 yards per reception over his two seasons in the NFL because of his speed, hands, and physicality. He's excellent on screens and hopefully Offensive Coordinator Scott Linehan will get him even more involved in 2018. If they decide they want to get him even more involved in the passing game than he was in 2017, I could see an increase in targets per game from 3.8 to about 4.2 targets per game. Remember, they value Elliott's role as a pass protector, which helps Dak Prescott as much as the offensive line does. So, what could Elliott's numbers in the passing game look like in 2018 if they get him even slightly more involved in the passing game? 4.2 targets per game would be about 67 targets over a 16 games season. If we use his career catch percentage of 75.3%, Elliott would be looking at about 50 receptions in 2018, which isn't a far cry from his 2017 pace of 41.6 receptions. If he sticks with his career average of 10.9 yards per reception, then we're looking at a 545 yards receiving on the season. Even if he only manages eight yards per reception, the 400 yards would still be a career high for Ezekiel Elliott. 50 receptions is probably the high number for Elliott, while the low is about what he did in 2016 at 32. Elliott is a threat in the passing game. We've seen him take screens to the house each of the last two seasons, against Pittsburgh in 2016 and San Francisco in 2017. With Tavon Austin in play to give the Dallas Cowboys more options with misdirection, Elliott's work in the screen game could become even more effective. Touchdowns are far more difficult to predict than carries, yards, and receiving totals, but we can look back at his career thus far and see a pattern. In 25 career games, Ezekiel Elliott has 25 total touchdowns. He averages a touchdown a game. It's likely that we could see that average increase in 2018 with Dez Bryant and Jason Witten, two huge red zone weapons, no longer on the team. It's difficult to know exactly how a game will play out and what the game script will allow for a player like Ezekiel Elliott who does his best work when the team has a lead, but I'm going to bet that he hits 360 carries in 2018, which would put him at about 22.5 carries per game. Some games he'll get more and some games less. I'm also going to assume that he returns to five yards per carry in 2018 with the addition of Connor Williams to help open holes and make the offensive line more athletic, physical, balanced, and complete than it was a year ago. So, at 360 carries and five yards per carry, Ezekiel Elliott is looking at around 1,800 yards rushing. While that may look like an outlandish number, based on his career to this point, that's certainly achievable. In the passing game, I see Elliott setting career highs in receiving at 45 receptions for 490 yards. On the touchdown front, I'll stick with Elliott's touchdown per game averages and project he scores 16 total touchdowns. Final Projections: 360 CAR, 1,800 Rush YDS, 60 TAR, 45 REC, 490 REC YDS, and 16 total TDs. Too high, too low, just right? What do you think we can expect from Ezekiel Elliott in 2018? What Should We Expect From DT Maliek Collins In 2018?